A preview booklet for the 2017 Joint Annual Conference, to be held Nov. 17-19 in Chicago, is now available online. Information in this 24-page guide includes a schedule of events, descriptions and time slots for panel sessions, and descriptions for Pre-Conference Workshops and other on-site activities. 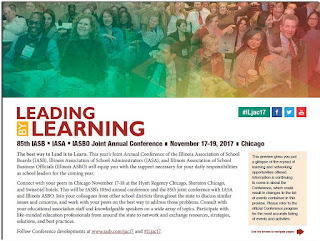 This year’s event – “Leading by Learning” – will be the 85th Joint Annual Conference of the Illinois Association of School Boards, Illinois Association of School Administrators, and Illinois Association of School Business Officials. More than 100 panel sessions will be presented on Friday, Saturday, and Sunday. Titles, descriptions, and time slots are listed in chronological order (see pages 6-17 of the preview). 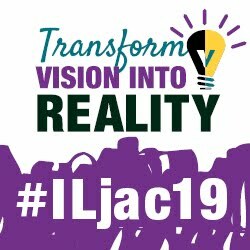 The 60-minute panels will be presented at 9, 10:30 a.m., and 2 p.m. on Friday; 10:30 a.m., 12:30, 2, and 3:30 p.m. Saturday; and at 8:30 a.m. Sunday at the Sheraton Grand Chicago and Hyatt Regency hotels. In addition, a Carousel of Panels will be held at 1:45 p.m. Saturday (see page 14). Other professional development opportunities will be conducted specifically for superintendents, business officials, attorneys (see page 22), and school board members on Friday, Nov. 17 (see page 21). A separate School Safety and Security Seminar is also available Friday (see page 23). Each of these events requires an additional fee and advance registration. There is no additional charge for those attending the two-day Administrative Professionals’ Program (see Pages 16-17); however, this event does require paid conference registration. Information about this year’s keynote speakers can be found on page 5. Additional details and updates will be available in the official Conference Program, which can be picked up Nov. 17-19 at the registration desk at the Hyatt Regency. Those seeking to register or secure housing can access those forms online at: http://conference.iasb.com/.